(Nanowerk News) A new biosensor, applied to the human skin like a temporary tattoo, can alert marathoners, competitive bikers and other “extreme” athletes that they’re about to “bonk,” or “hit the wall,” scientists are reporting. 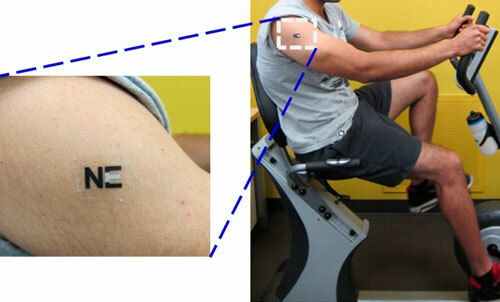 The study, in ACS’ journal Analytical Chemistry ("Electrochemical Tattoo Biosensors for Real-Time Noninvasive Lactate Monitoring in Human Perspiration"), describes the first human tests of the sensor, which also could help soldiers and others who engage in intense exercise — and their trainers — monitor stamina and fitness. The new skin-worn enzymatic biosensor exhibits chemical selectivity toward lactate with linearity up to 20 mM and demonstrates resiliency against continuous mechanical deformation expected from epidermal wear. The device was applied successfully to human subjects for real-time continuous monitoring of sweat lactate dynamics during prolonged cycling exercise.